A Seljuk spa of the day, this han was built on top of a hot springs, and provides a separate stabling area for animals. Karpuz, Anadolu Selçuklu Eserleri (2008) v.2, p. 26. The Karakurt Han is located on the Kirşehir-Kocahisar road, in the village of Karalar, 16 km from the city of Kirşehir. The han is also known as the Kalendar Baba Han. This han may have been built as early as 1135. Although there is no inscription plaque indicating the construction date or the patron, it is generally assumed that it was built in 1136. However, in view of the advanced plan of the stables configuration, which places the comfort of the traveler at the forefront, it can be suggested that a first structure was built at this time and was further developed in a later period, either in the late 12 or early 13th century. The stables section was probably added at this time. There is no inscription plaque. 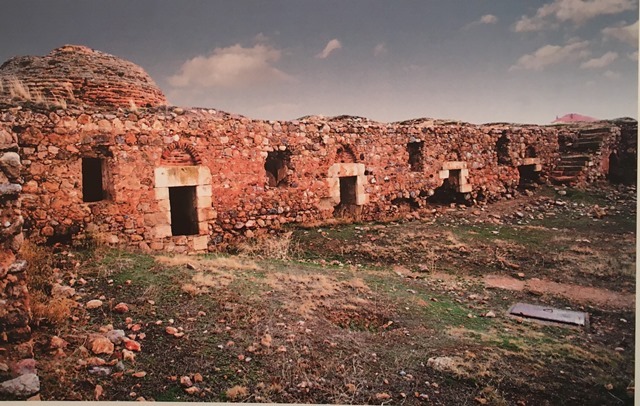 Kiliç Arslan, the second son of Sultan Suleyman, apparently built a structure at these hot springs, known as the Kalendar Baba Springs, in 1136. The rooms are distributed around a central courtyard, known as the "open" plan. There closed rooms only. The courtyard is the basis of the design. This han shows an unusual plan in response to its very specific function as a spa. The plan of this han shows similar features to the Eshab-i Keyf Han with its separate stable section, and the Kargi Han with its western arcade section with fodder basins and loading platforms. It appears that all was done to provide comfort for the traveler, with such features as a separate section for the animals and comfortable rooms with chimneys for providing warmth. The Karakurt Han is a very unusual and unique Seljuk han, as it has been built with a specific purpose: to provide accommodation for visitors to the hot springs located here. The han was literally built around the hot springs in order to take advantage of them. These springs have been in use since ancient times and were well-known in the Byzantine era. The han comprises a covered section (stables) and an open courtyard built around the hot springs. The courtyard is lined on the sides with accommodation rooms for travelers and for those using the hot springs. It also includes an unusual entry hall with an iwan and stables on the south side. A room for the innkeeper is also provided, separate from the guest rooms. The entry to the han displays a very unusual feature, rarely seen in Seljuk hans. It consists of an entry in the form of an iwan with stables on both sides of it along the south side for horses, donkeys and camels. The entry comprises an entry hall followed by an iwan. The iwan is covered with a barrel vault which leads to the northern wing of the stables. It is 4.6 m wide and 5.25 m long and has a stone floor. The inner door recalls the form of a crown door. Access to the northern wing of the stables is through an entry positioned obliquely on the north side of the entry iwan. The southern wing of the stables is accessed from the entry hall only. The walls were built of stone and mortar. This configuration for the stables is a significant advancement over the traditional han architecture, as it provides consideration for the comfort of the travelers. In this configuration, the animals are kept separate from the lodging areas of the guests. Comfort appears to have been a primary concern for the layout of the service areas. Three guest rooms are positioned along the exterior face of the stables and face the courtyard. These rooms are larger (7.90 wide and 18.50 long). It is not known how they were covered. The courtyard is L-shaped and regroups all the service and accommodation rooms. There is no differentiation in the rooms used in summer and in winter. The hot springs can be accessed from all rooms. The courtyard is surrounded by guest rooms on the east, west and south sides. There are 12 guest rooms in total. On the north side are 2 hot springs rooms, one of which contains the hot springs itself. The room in the southwest corner is accessed only from the room next to it and not the courtyard. 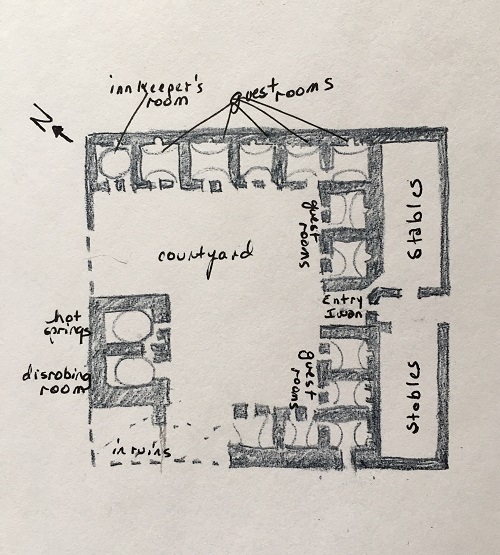 There were probably 2 more guest rooms in the southwest corner, bringing the total to 14. These two rooms were destroyed and their plan could not be reconstituted. The guest rooms are 4.5 m in length, and approximately 4 m wide. The entry to each room is surmounted by a thick (32 cm), flat lintel. Each room has a chimney and a fireplace with little niches on each side used to set candles. The guest rooms are covered with barrel vaults and have windows which give access to the courtyard. In addition to the 12 guest rooms, a separate room in the north east corner, covered with a dome, was reserved for the han keeper or manager of the springs. The hot springs rooms are located on the northern side. This service area is comprised of two interconnected rooms which are also directly accessible from the courtyard. These two rooms are approximately square in shape and each is covered with a dome. The first room (4.30 x 4.35) is the disrobing room, and the second room (4.30 x 4.50) is the room which includes the hot pool of the springs, fashioned out of marble. The pool is set against the eastern corner. A set of stone stairs in located in the southeast corner (4.75 m high) of the courtyard leads to the roof. This is a simple, functional han which does not include any decoration. The han is in a ruined state. It suffered seriously from the severe earthquake of 1938. This structure was first studied and drawn up by Semavi Eyice and Yilmaz Önge in the early 1970's. Excavation work was undertaken in 2015 by the Nevşehir Cultural Preservation Foundation. The plan of the han was again drawn at this time. The han deserves to be restored, which would honor its original plan and historical importance. Arseven, V. Karakurt Hamami. Turk Folklor Arastirmalari Dergisi VI (77), 1955, pp. 1219-1232. Eyice, S. Kirşehir'de Kalender Baba Ilicasi. Istanbul Üniversitesi Edebiyat Fakültesi Tarih Enstitüsü Dergisi (2), 1971, pp. 229-254. Karpuz, H. & Kuş, A. & Dıvarcı, I. & Şimşek, F. Anadolu Selçuklu Eserleri, 2008, v.2, p. 26. Yilmaz, Ibrahim. "Kirşehirde Selçuklu Dönemine Ait Bir Yapi: Karakurt Han-Ilicasi." Uluslararasi Hakemli Tasarim ve Mimarlik Dergisi, Winter-Spring issue 2017, p. 56-79.